CONGRATULATIONS – A Hat Trick 3 in a row. Russell McCarthy 2016 Motoring Classics Thoroughbred Sportscar Champion. 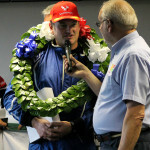 Despite a non start after an accident in a previous race Russell had gained enough points to take the Thoroughbred Championship for the third time. It could have been tight as second highest points holder Martin Barrow had also pulled out in practice. The weather was heavy rain, off and on and if Martin had managed to continue then it could have been either of them but Martin was also unable to race. 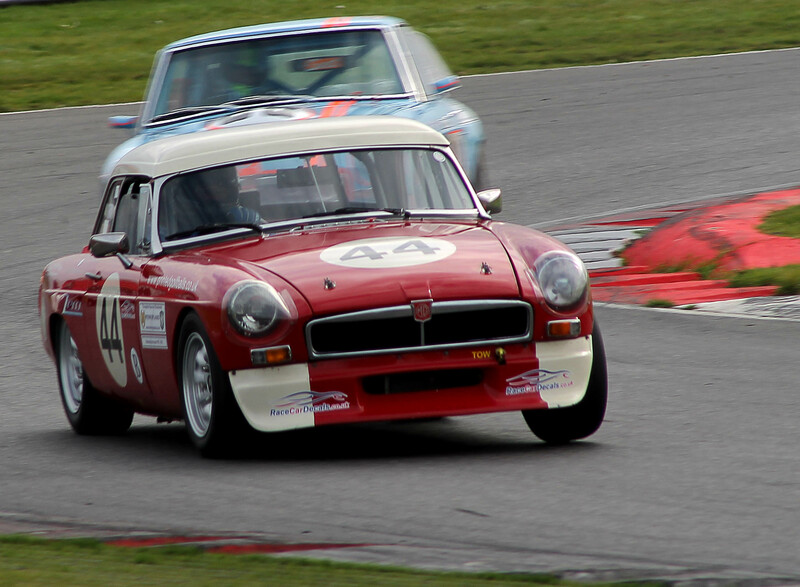 The last race of the 2016 Season brought us back to the Snetterton 200 circuit with the MGCC. Checking the weather all week did show that Saturday would be wet and it rained during the Friday/Saturday night but we awoke to cloudy but dry conditions so we were hopeful that the rain had passed us by. Qualifying was at 11.30 and although there had been 23 entered originally – fantastic – only twenty managed to take part in qualifying with Ian Prior and Paul Khouri having terminal engine problems in the BCV8 qualifying session. Angus Dent on the second lap coming round what is now called Murrays, but we all know it at Russell Bend, made contact with the high curb which threw him up and over landing on his roof and staying there. Qualifying red flagged and Angus removed himself from the car. Walking away completely unhurt and the car itself only had a shattered screen and a remodelled hardtop. Angus though calling it a day. Qualifying resumed and completed nine laps with Pole going to E class Russell McCarthy with a 1.20.175 alongside James Wheeler with Rob Spencer and Neil Fowler on row two. Row three Class B Pole Mark Scott with 1.27.032 although Mark’s car was back on his trailer with a problem but there was Class D Pole Ken Deamer with 1.27.193. Row four guest driver Chris Edwards on a 1.27 683 as the Pole-sitter for Class C (without points) alongside Babak Farsian. Row five Barry Holmes and Martin Barrow and on row six Jim Bryan and Kathy Sherry. On row seven Simon Cripps and Ben White and on row eight Paul Rayment and Clive Gimson. Finishing the field Hayleigh Spencer, Steve Lockhart and Phil Lambe. By the race however, which had a late start at 17.10, after the weather had really taken a turn and an horrendous storm had flooded the track during some earlier races and caused a few cars to withdraw. When the grid formed up we were short of Russell McCarthy, Martin Barrow as well as Mark Scott and Angus Dent, putting the grid down to sixteen. A drying track saw only three left in the class and from the lights Rob Spencer took immediate control with Neil Fowler hard on his tail where he stayed for four laps before Rob had a moment and Neil took the lead until in his mirrors he saw the fast approaching James Wheeler. James had started from the pit lane but pulling up through the field to third by lap two but nine seconds behind Neil. By lap five he was on Neil’s tailpipe and by lap seven James had passed to take control to the flag. Neil however having an off and re-joining further down the field some 40 seconds behind. The finishing order James, Rob and Neil. 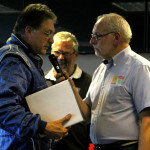 James getting driver of the race award from the commentators. From the lights Jim Bryan stole the class lead from Ken Deamer to take it to the lights pulling away from the rest of the class gaining fastest lap in the process. Ken Deamer keeping in second with a fast approaching Paul Rayment, Paul catching him by lap eight as Ken found something hard to damage his nearside front while Paul carried on to the flag. Behind Hayleigh had a few close laps with Barry Holmes, Barry keeping just in front to the flag. Well done Jim a good show. Only four in the class. Guest Chris Edwards dived through to tag on behind the leaders in fourth overall where here remained to the flag, not sure what tyres he had on or what engine he had but whatever they were they were good and he drove well. Kathy Sherry got a great start to keep just in front of Ben White to the flag never more than a few seconds away from each other. Kathy bringing home the Championship class with a fastest lap but second on the road, Ben second in class and finishing the field Phil Lambe. Well done Chris, come back in 2017 and race more often. Four out in the class for the race with Babak Farsian and Simon Cripps up front Simon just not able to get to Babak by the flag but gaining fastest lap in the process. 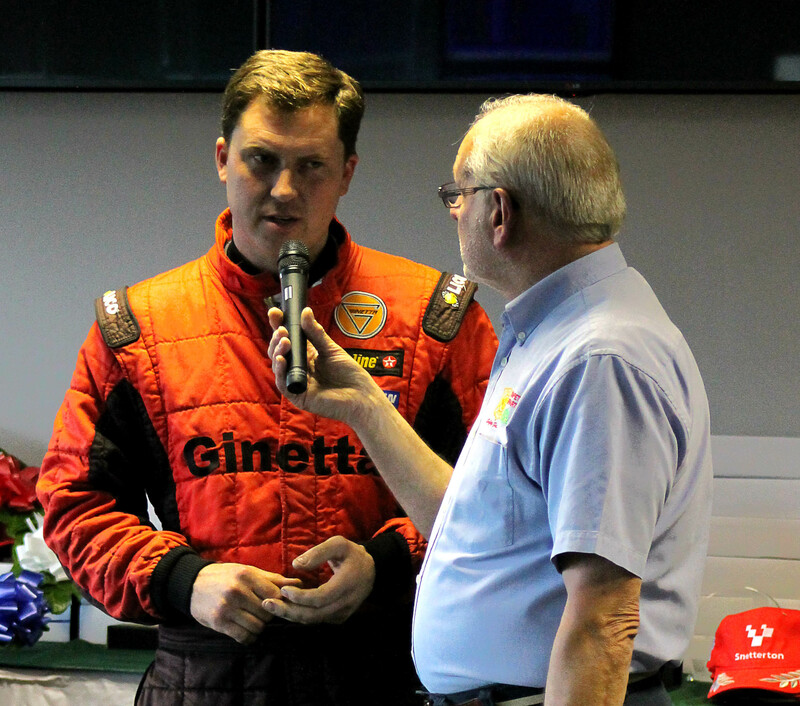 Steve Lockhart expired on lap two leaving Clive Gimson to bring home the class in the GT6. Well done Babak. Congratulations to James Wheeler for his overall and Class E Win. 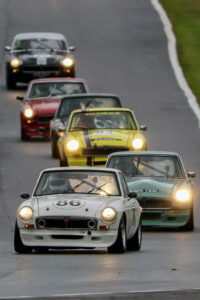 A turnout of only thirteen drivers arrived for the MGCC meeting at Oulton Park. The weather had been predicted as wet and when we awoke early on Saturday morning the sun was shining but as the predicted time of 10am arrived the sky darkened and the rain started. 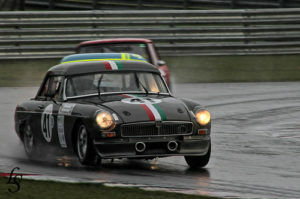 It continued until 4ish so the qualifying was in wet conditions but the race was in damp as the rain had ceased. 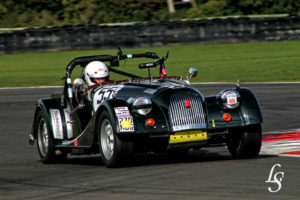 The conditions caused a few minor track infringements and a few ‘straight on at the chicane’ errors and a nasty incident on the first lap of the race at Halls Bend when a re-joining Babak found Kathy Sherry in the Morgan sliding into her car causing considerable damage and to the front nearside of his. Kathy’s race finished but Babak recovered and continued to the flag. From the lights the field stormed up round Halls Bend, Jim Bryan getting a magnificent start. Neil headed the pack with Ian just behind and Russell finishing the E class. As the rest of the field went round Halls Bend Babak slipped off track and hit the wet grass and as he spun round back onto the track caught Kathy. The safety car came out and all the remainder of the field went round behind the safety car which came back in after just one lap and the race started again on lap two all now closed up. Neil kept in the lead of the race with Ian just a length behind hounding him to the flag just unable to pass. Russell came home third but some eleven seconds behind the battle. Jim Bryan, Barry Holmes in class D had a few close laps until Babak came up through the field to try and catch Jim, both having a good battle to the flag. Beautiful, unspoilt, Cadwell Park – a lovely place to spend a weekend.You either love it or hate it. Its narrow, its demanding but above all its one of the most challenging circuits and most say a ‘drivers circuit’. 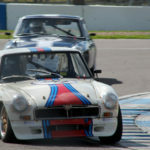 The 750MC organised meeting over the weekend of Saturday and Sunday 6th and 7th August was set for a double header for both BCV8 on the Saturday and a double header for Thoroughbreds on the Sunday. The sun shone and it was another well organised and friendly 750MC meeting. For most of us the trip was quite long and harrowing. The southerners had the M25, M11 or A1 to contend with all with their assortment of holdups. We left home at an unearthly 5.30am on Friday to beat the M25 traffic and managed to have quite a pleasant trip even stopping off for a breakfast in an American Diner on the A1, delicious and arriving at a reasonable 10.30am on Friday morning. A test day for a few drivers saw some happy faces and no major problems. 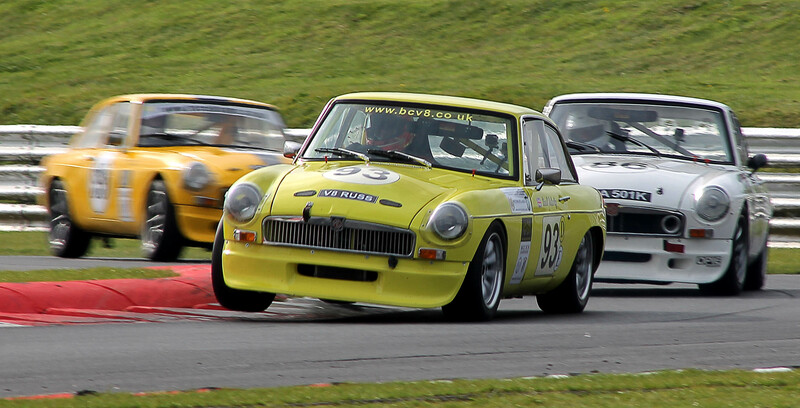 Ian Prior had finished rebuilding his car from the Rockingham crash and a superbly finished green MGBGTV8 was waiting for its first outing. Friday evening had a couple of BBQ’s with the Wheeler team having their own event and Neil Fowler doing a grand job supplying the rest of the crowd. Saturday morning came quickly at 06.15 with the arrival of Rob Spencer who blasted out his truck horn to the sleeping paddock. 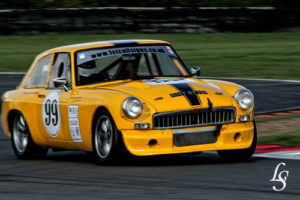 I had not intended to book a meeting at Cadwell for the Thoroughbred Championship but had been contacted by Peter Best MG Challenge to see if they could join us on the grid. I felt that with a combined race with the Peter Best we could benefit and it would be a worthwhile trip. The grid holds 28 and it was felt that we could manage our usual 13 and possibly PBI could manage a 13 – 15 so we could have a full grid of 28. 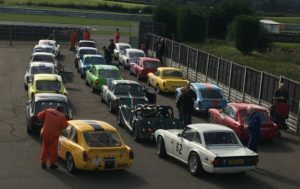 However, on the day the 750MC had four Mini Coopers to place and had tried to put them in with firstly Peter Best A class which did not gell well with them and so 750MC then split us up completely and gave Peter Best a race of their own with 15 entries and one of our own with our booked 11 plus the four Minis. Needless to say I hadn’t felt we should go to Cadwell as we couldn’t get the numbers for just the Thoroughbreds and 11 is not a grid!! These 11 also went up and down, Ken Deamer who had been concentrating on his business all season had entered but had pulled out after the BCV8 practice and Barry Holmes had not been able to start his car up so didn’t bring it. Now down to 9 TSCC entries. I made a ‘deal’ and asked for any additional entries on the day and managed to get two back in the form of Jonnie Wheeler, driving James’s car and Ian Prior back out in his rebuilt V8. Up to 11 again. Scrutineering gave no major problems with the cars and we had two B class, three C class, two D class and four E Class. Qualifying was a full grid of Peter Best, Thoroughbreds and the Mini Cooper Cup and all appeared to finish with no problems. 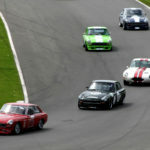 Round Six Qualifying times gave a grid of Thoroughbred and Mini drivers with the Mini’s forming up behind the Thoroughbred grid and having a ten second gap to their start. Overall and E class Pole went to Russell McCarthy with a 1.39.050 alongside Neil Fowler and on row two Ian Prior and Jonnie Wheeler. Row three D class Pole Jim Bryan with a 1.49.070 alongside C class pole Kathy Sherry with a 1.51.790. 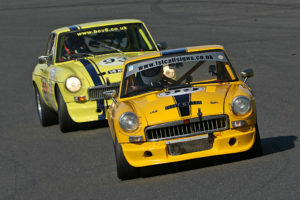 On row four Martin Barrow and Class B Pole Steve Lockhart with 1.54.890. Row five a vacant spot for Roy Chamberlain who had developed his persistent head gasket problem but a present Clive Gimson and the final driver for the Thoroughbreds was Ben White all by himself on the sixth and our back row. From the lights Russell kept control for two laps with Neil Fowler, Ian Prior and Jonnie Wheeler behind. On lap three Neil stormed through to take the lead and remain there until the penultimate lap when he retired with an alternator issue and no power. For those six laps three drivers were as one nose to tail with only a car length between them. Once Neil had pulled off Russell stole the win with Ian just 200ths behind him at the flag getting Lap Record in his effort to pass. Jonnie Wheeler out in son James’s car had a good consistent race but was a bit in awe of the power and wanted to keep it all together for James so just enjoyed the experience. Well done Russ. Kathy, class C Polesitter managed to take the class from lights to flag gaining fastest lap, again only two out as Roy Chamberlain had broken down. The second fastest time put Neil Fowler on Pole with a 1.39.780 alongside Russell McCarthy. On row two Jonnie Wheeler alongside Ian Prior and on row three Class D Pole Jim Bryan with a 1.50.960 alongside Martin Barrow. On row four Kathy Sherry Class C Pole alongside Steve Lockhart Class B Pole and on row five Roy Chamberlains vacant spot, Roy still suffering from his head gasket problems and Ben White. Finishing the Thoroughbred field Clive Gimson. 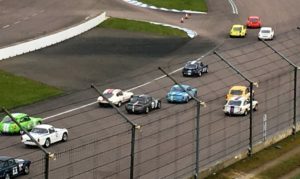 From the lights an eager Neil Fowler got a bit of a jump start and roared away followed by the rest of the field, when they came back round Ian Prior was leading the pack with Neil second and Jonnie Wheeler third with Russell bringing up the rear of the E class. By lap two Neil was back in charge now with Russell close on his tailpipe and by lap five Russell had passed to lead the field to the flag. Behind Neil stayed in second but had a ten second penalty to drop so third placed Ian Prior had to maintain his position to take advantage which he just managed to do putting Neil back into third at the flag. Jonnie Wheeler just happy to follow the leaders home not too far behind making sure he kept the car in good order for his Son. Class D only had Martin Barrow and Jim Bryan out and Martin brought the class home alone as Jim’s race finished on lap two. Class C had Kathy Sherry and Ben White out and they both had a good dice with each other for the majority of the race with Kathy just keeping Ben at bay to the flag. Class B had Steve Lockhart and Clive Gimson out both having a close race for just five laps when they both disappeared off circuit. Not sure what to say about the race results but we had a lovely presentation after the race before we all dashed off in our different directions to try and get home before the traffic built up. Nice weekend out racing only seven Thoroughbred finishers and everybody seemed to get a trophy. All of you for coming. The ‘fastest track in the UK’ welcomed us back to a BARC meeting and despite a really wet summer we were lucky and the weekend was dry and a bit cloudy with some sunshine showing through on Sunday. Hence a red face when I got home. There were a very disappointing entry of only 13 on the day so a loss for the TSCC coffers. 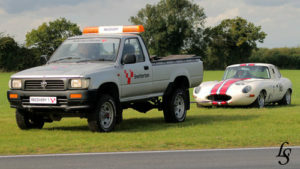 2 Class B, 4 Class C, 4 Class D and 3 Class E. Scrutineering gave no major problems all meeting the standards required. Practice saw all thirteen drivers on track with most finishing with no problems except Martin Barrow had a water issue so pulled off early to try and conserve his engine. Most drivers however were noticing that their tyres were taking a bit of a bashing. It was good to be at a circuit with a club still practicing what was the norm a few years ago. Collection area, onto the circuit to find your way round, green flag lap for a further circumnavigation to get the tyres warmed, then the full fifteen-minute race. No cutting timings down because everything had to be crammed in. Well done BARC. We will be back! Qualifying times put Neil Fowler on overall and E class Pole on 1.28.825 with Rob Spencer just half a second behind alongside on the grid. Row two Simon Cripps next to Class C Pole Alan Charlton with 1.35.708 and on row three Paul Khouri alongside Class B Pole Angus Dent with 1.36.656. Row four Barry Holmes on D Class Pole with 1.38.313 alongside Kathy Sherry and on row five Hayleigh Spencer alongside Rob Roodhouse. On the penultimate row Steve Lockhart and Martin Barrow and finishing the field Phil Lambe. From the lights both Neil and Rob dived away with Simon on their tail. Rob managed to hold Neil back for four laps, Neil pouncing all over him until he dived through to take the lead, getting fastest class lap in the process. Simon hung on for four laps until he lost all his water and pulled off. Later diagnosed as a screw coming out from the back of the water pump housing. Behind Barry Holmes was heading Class D with Alan Charlton and Paul Khouri just behind, Barry leading the pair until he had a moment on lap six, re-joining behind them a little further down the field. Martin Barrow pulled off on lap three, with the water issue returning leaving Rob Roodhouse to chase after Barry Holmes still up front in class D.
Lap two Kathy Sherry in sixth overall and looking good got collected by an out of control Angus Dent putting Kathy out of the race and Angus at the back of the field. Up front Neil maintained his advantage for five laps with just inches to Rob waiting for his opportunity which came on lap ten when Rob dived through on the inside to take the overall race win at the flag. Alan Charlton and Paul Khouri had a race long close battle, never more than a second between them and Alan taking the class win by under a second with Paul getting fastest lap in his efforts. Phil Lambe the final C class finisher. Barry headed class D with Rob Roodhouse catching him by lap seven after his off track moment and hounding Barry for five laps Rob finally managing to pass to take the Class D win. 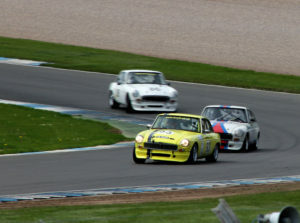 Hayleigh Spencer keeping in close contact with the two and finishing third in class. Rob Roodhouse taking the fastest lap in class D.
Amongst the D class mix Class B Steve Lockhart who had a few close laps with Hayleigh and finishing the order Angus Dent unable to catch Steve but taking fastest class B lap early in the race. 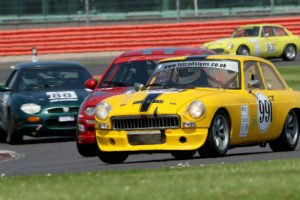 Silverstone the Flagship of the M G Car Club season a meeting for all MG supporters to gather and meet up again. The Thoroughbred race has usually been scheduled for Saturday but with the influx of other Championships to the MGCC’s premier meeting Thoroughbreds and some other MG Championships have been moved on to the second day. We have raced on the Silverstone GP circuit in three different formats since 2010. In 2010 we had 37 and we had a double header. Since then the Arena Circuit in 2011 40 grid and 2012 33 grid. 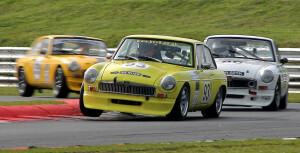 From 2013 with a 32 grid we moved on to the Silverstone Historic GP and for 2014 31 grid, 2015 29 grid and this year we only managed 20 and were amalgamated with the Cockshoot cup. We were scheduled for first qualifying on Sunday morning but when we assembled the weather was a disappointing mist over the whole circuit. Instead of waiting a few minutes it was decided that the drivers set off behind the Safety car which most of the drivers wondered why because as soon as the qualifying started the drivers could see way in advance, most saying they could see up to four marshal points immediately. The Safety Car however did not pull in for four laps. I had been called over to the Clerks’ office to discuss the grid order but as I went up the stairs and looked out over the circuit I could see everything and was told I was no longer needed as we could have a couple of flying laps. Overall race and Class E James Wheeler on a 2.24.651 alongside Neil Fowler on row one. Row two Rob Spencer and Simon Cripps and on row three Russell McCarthy. Row five Class D Pole Jordan Spencer with 2.35.263 and on row eight Class C Pole Alan Charlton with 2.41.939. Row ten Jim Bryan and Barry Holmes and on row fourteen Paul Khouri alongside Martin Barrow. Row fifteen Class B Pole Steve Lockhart and on row sixteen Rob Roodhouse. On row eighteen Bob Lines and Phil Lambe and on row nineteen Simon Alexander and Kathy Sherry. Finishing off the Thoroughbred running order were Roy Chamberlain and Brian Playford. A foggy start to the day meant qualifying for the combined Thoroughbred Sports Car and Cockshoot Cup outing was hampered, with just a few flying laps to set the best times. By the arrival of race one, the sun was shining and the temperature had definitely risen. 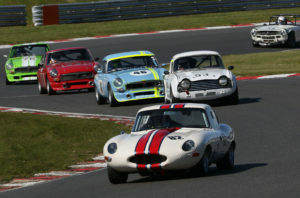 The Thoroughbred Sports Cars took over the front half of the field, with James Wheeler at the helm. With a three second cushion by race end, Wheeler was able to defend his crown unchallenged, ahead of Neil Fowler in runner up spot. Fowler’s race was less simple, when the charging Rob Spencer launched an attack for second place. As the pair battled, a side by side moment for position made for interesting viewing. 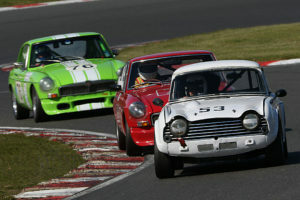 The action soon simmered, however, when Spencer found himself by the wayside just three laps from the chequered flag. With clear space behind him, Fowler claimed a comfortable second place, ahead of Russell McCarthy and Mark Halstead. Cockshoot Cup honours saw Gary Wetton sweep to victory. 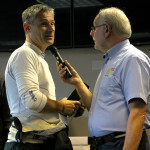 After suffering with kidney stones on Friday, Wetton recovered enormously to race at Silverstone this weekend. Despite his ailments, he claimed a clear win in race one. A race long battle saw Wetton struggle for control, as he and Philip Standish swapped positions multiple times. However, as Standish encountered trouble that forced him out of the running, Wetton went on to claim an untroubled victory. 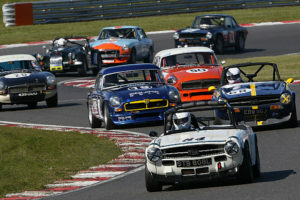 Former MG Trophy racer Ross Makar made his mark on the Cockshoot Cup this weekend with second place in race one, some 37 seconds ahead of Ashley Woodward. Jason Simm featured heavily in the mid race scraps on circuit, before crossing the finish line in a strong fourth place. David Coulthard had looked good for a sound result, before he returned to the pits just five laps from the chequered flag. The Cockshoot Cup returned on their own for race two, and it was Ross Makar who claimed the spoils this time around. Fierce competition announced itself in the form of Wetton, as Makar tried his best to fend him off. After 20 minutes of high speed action, the chequered flag rescued Makar, to crown him victor by just 0.6 seconds ahead of Wetton. Woodward steered his way to third place, albeit some 34 seconds adrift. 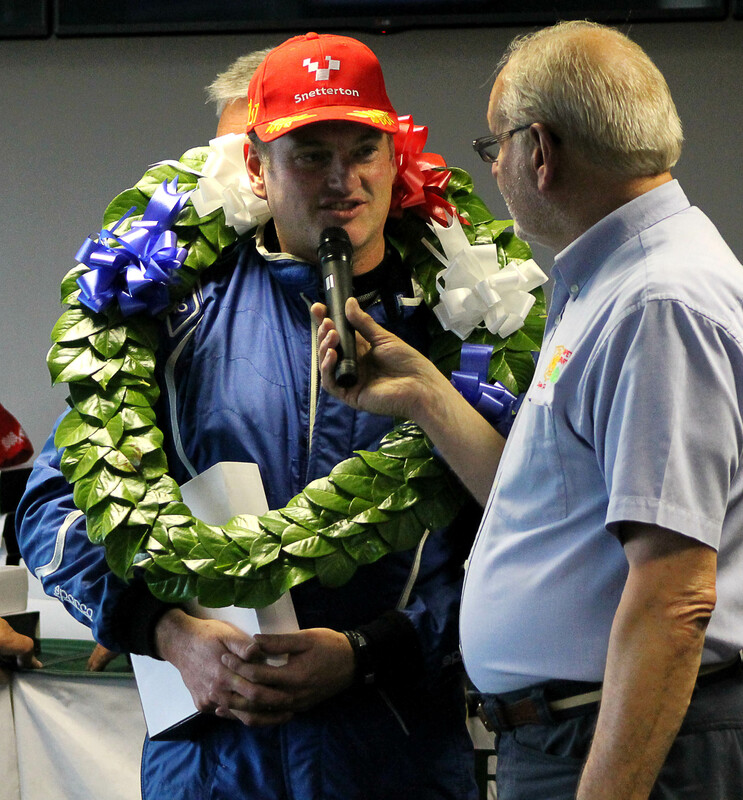 Jonathan Harker collected fourth place, with Ian Winstanley fifth. Coulthard recovered from his race one woes to claim sixth place in race two. An expected and widely forecast wet weekend turned out to be just cloudy with the occasional drip. Sun and cloud for most of the Sunday. The Motoring Classics Thoroughbred Race was listed as Race 3 on the programme but we had a very disappointing entry of only 14. The Morgan Sportscar Club’s one and only Race Meeting during a Season is always very laid back and the Morgan entries were quite low as there were several other Meetings suitable for the Morgan driver, some on the continent. Needless to say with their choice of events none of the Morgans raced with the Thoroughbreds. Qualifying for most was successful except Martin Barrow and Simon Cripps both finding the kitty litter and had a bit of stone clearing before they could go back out. Simon also out in the BCV8 had to be quick about it before his second qualifying but Martin had longer to destone his E Type. Overall and E Class Pole went to Rob Spencer wrongly classified as a D class car with a blindingly fast time of 1.17.921 alongside Russell McCarthy with a 1.18.018. Row two Neil Fowler and Simon Cripps and on row three Jon Ellison back out as a Guest driver in his TVR Griffiths still getting to grips with it. 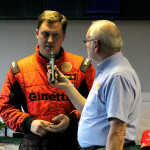 Alongside Jon was Class D Pole Barry Holmes with a 1.27.002 and behind on row four Jim Bryan and Hayleigh Spencer. Row five C Class Pole Roy Chamberlain with a 1.30.223 and Paul Rayment and behind on row six B class Pole Bob Lines on a 1.32.499 alongside Martin Barrow. Finishing the field on row seven Guest Chris Reece out for a test drive with us and lastly Phil Lambe. by Rob Spencer round the outside at Redgate. Rob kept control of the race to the flag gaining lap record and leaving Russell having to make do with second place. Behind staying close for a few laps Neil Fowler and Simon Cripps, Simon making a couple of detours to put him back further in the field. Barry pulled slightly ahead to win the class leaving Jim to battle with Martin Barrow for a few laps, Martin pulling past to steal second in class D and gaining fastest lap in the process on the last lap. Jim coming in third. Of the remaining D class contenders Paul Rayment managed eleven laps before he pulled into the pits with a suspected diff problem and Hayleigh Spencer finished ninth overall and fourth in class. Class C Roy Chamberlain lead the class of two from lights to lap twelve but had a moment and retired at the Chicane leaving Phil Lambe the only finisher taking the win in class. Class B again a class of two with the class being led from lights to flag by the MGA of Bob Lines out for one of his rare occasions and coming out at Silverstone in his D type Jag. Behind Bob a newcomer to the Championship coming for a test race Chris Reece who kept Bob in his sights but was unable to catch him. We were unsure of the forecast as each day it changed but what a lovely weekend with lots of red sunburned faces. We awoke on Sunday to clouds but the sun soon shone through. By 11.44 assembling in the Pits it was cloudy and some sunshine for practice. We had twenty one entered for the Thoroughbred race but on the day twenty on the practice sheet and nineteen who would be on the results sheet. 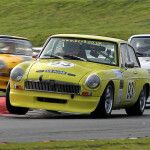 On row six guest driver Peter Samuels out in Son Guy’s MGB alongside Hayleigh Spencer and on row seven Ian Prior out in a borrowed B class car he sold to Simon Cripps while his E class car is being rebuilt next to Rob Roodhouse. Kathy Sherry on row eight alongside Steve Lockhart and returning Thoroughbred driver Angus Dent back out after a decade or more alongside Phil Lambe and finishing the field Simon Alexander alongside the vacant spot for Richard Lawson. James Wheeler continued his dominant weekend, to claim a third win in as many races during the weekend. 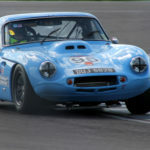 The sole outing for the Thoroughbred Sportscars saw Wheeler control the pace from start to finish, despite fierce attention from Russell McCarthy and Rob Spencer. After finishing second to Wheeler in both BCV8 Championship races on Saturday, McCarthy was keen to unnerve him this time. Despite fastest lap and a number of brave attempts around the outside of Druids, McCarthy was unable to nudge Wheeler from his victorious perch. Spencer had looked strong for a second place finish, but after engaging in battle with McCarthy, he slipped back for a third place finish. 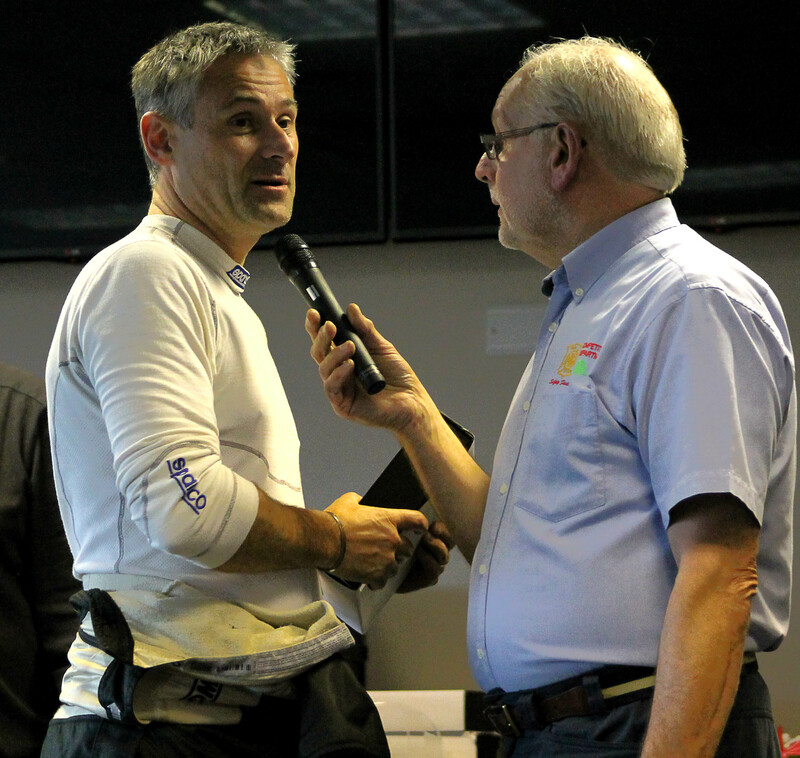 Neil Fowler made amends for a difficult second BCV8 Championship race on Saturday to claim fourth place, ahead of Simon Cripps and Barry Holmes. 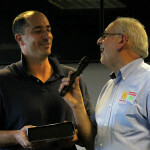 Cripps also collected the Driver of the Race award. From the lights Guest driver James Wheeler made a great start to lead Rob Spencer, Russell McCarthy and Ian Fowler up round Druids, the four tight together as they came down to Graham Hill Bend. 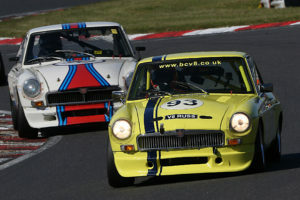 James led the race from lights to flag as he had done in the two BCV8 races on Saturday. Russell came round in second place for the first three laps then Rob dived through, all three drivers within half a second up front for seven laps before back markers joined in the equasion. James managing to pull past and get a small distance to Rob. Ian fourth in class and overall but losing touch slightly with the front runners. Rob hung on to James as best he could then Russell joined him to give some spectacular close racing with Russell managing to pass Rob by lap eleven to storm off after James. By the flag Russell had managed to get up close and personal to James breaking the lap record in the process but as they crossed the line James had a .7 advantage. Rob slid back slightly and Ian had him in his sights but was unable to catch him by the flag. A very intense drive by four top class drivers. 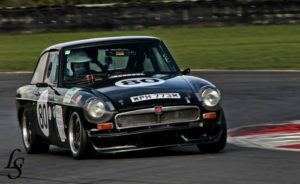 Martin Barrow had a great start and stormed off to lead the class having a great few laps with Simon Cripps in Class B. Behind Barry Holmes gradually hauled him in to hound him constantly managing to pull past as Martin overheated to take the class spoils. Barry putting up a great fight breaking the lap record in the process. John Yea and Rob Roodhouse had a few close laps John going round the outside at Paddock hill and managing to pull ahead of Rob to take the flag third in class after a great drive first time out in anger. Rob Roodhouse came home fourth in class and twelfth overall and finishing the class Hayleigh Spencer after a great few laps with Rob thirteenth overall and fifth in class. Lights to flag out in his B class car fifth overall and commentators well deserved driver of the race. Second and third in class Angus Dent and Peter Samuels gave a great show with Peter hounding Angus every lap Angus just keeping Peter behind to the flag after an exciting spectacle. Ian Prior, Steve Lockhart and Simon Alexander the remaining class finishers having good races with whoever they were around. A first visit to Rockingham since 2003 for the Thoroughbred Championship and back then we were racing on the National Circuit which is 1.70 miles long. This time we were on the International Super Sportscar Circuit or the ISSC, 1.940 miles long. When we arrived on Saturday evening it had just started to rain and it then decided to pour down. Most of the drivers opted to go off to the local House of Beverage and as soon as they left the sun came out and a beautiful sunset drowned the paddock in a warm glow, a nice red sky appeared and I was hopeful of a good sunny raceday. It was sunny, but there was a biting cold wind but thankfully no rain. Only fourteen drivers had booked to race on a circuit new to most of them and we had a first qualifying at 9.48am on Sunday morning. Our race was not until 4.25pm. Qualifying saw all 14 drivers out on track with Rob Spencer having mechanical problems in the qualifying and he also had a carb spit and catch fire in the collection area and an overzealous marshal drowned his car with his fire extinguisher so he would have to start from the back of the grid after a major clean-up of expellant. Qualifying gave Overall Pole to 2015 Champion E Class Russell McCarthy with a 1.32.010 with Ian Prior alongside and Neil Fowler and B Class Pole Simon Cripps with 1.37.457 on row two. On row three Jordan Spencer Class D Pole with a 1.40.136 alongside Babak Farsian and on row four Jim Bryans vacant spot and Class C Pole Paul Khouri with a 1.41.275. Jim having a very bad first time out with Thoroughbreds with an electrical problem that most of the ‘technical’ paddock were unable to sort. Row five Paul Rayment and Martin Barrow and on the penultimate row Michael Hunter and Phil Lambe and finishing the field Roy Chamberlain and a very rare sight Rob Spencer at the back. Behind Ian Prior held off Rob Spencer by meters until on lap 13 as they came round Brook for the last time Rob gained advantage and Ian lost control and the car veered into the pit wall. A sad end to a great battle. the front of the pack. Rob Spencer from the back of the grid steaming through the field to come round in fourth on lap one, the order Ian Prior, Russell McCarthy, Neil Fowler and Rob Spencer. As they came round all bunched to start lap two Russell had a Senior tank slapper and the order then changed to Ian, Neil, Rob and Russell. By lap four Neil was in charge but by lap five he had pulled off at Deans and Russell took the race home to the flag. Behind Ian Prior held off Rob Spencer by meters until on lap 13 as they came round Brook for the last time Rob gained advantage and Ian lost control and the car veered into the pit wall. A sad end to a great battle. Down to three in the class with Jim Bryan not sorting his electrical problems. 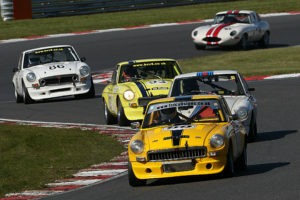 From the lights Jordan Spencer took control of the class with Martin Barrow maintaining steady pace. Paul Rayment pulled off at Deans on lap one with engine failure and Jordan continued home to the flag taking the class and Martin second. 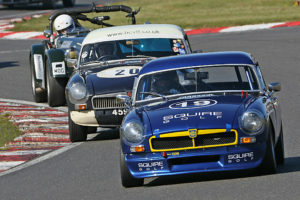 Four in the class and Paul Khouri got a good start and held the class from lights to flag taking a good class win. Behind the three TR’s of Michael Hunter, Roy Chamberlain and Phil Lambe had a great close race with Roy and Michael swapping places and Phil watching and waiting. Michael lost power on lap 12 his race finished leaving Roy to take the class win and Phil to follow him home. Only two in the class with Simon Cripps out in his B class car while his V8 is being rebuilt. Simon took class control from the lights and maintained it to the flag with Babak keeping him in sight but unable to catch him. A good race with battles throughout the field. There seemed to be much excitement in the Paddock for the last round of the Season and we had a good grid of 23 drivers. The racing was as expected very exciting right through the field especially at the front of the field with most of the E Class drivers in close contention from lights to flag. The weather was kind to us, a bit cold but sunny on occasion and a lovely way to finish the Season. We had Seven Class B drivers, Six Class C drivers, Three Class D drivers and Seven class E drivers. Qualifying put Overall Pole and E Class to Spencer McCarthy and alongside Russell McCarthy on the front row with Rob Spencer and Neil Fowler behind. Row three Simon Cripps and James Wheeler and on the fourth row Ian Prior and Class D Pole Ken Deamer. Row five C Pole Barry Holmes next to Class B Pole Mark Scott and on row six Babak Farsian alongside Peter Samuels with Class C Pole Paul Khouri and Martin Barrow on row seven. Kathy Sherry and Alan House on row eight with Paul Rayment and Clive Gimson behind. Michael Hunter and Philip Lambe on row ten and Finishing the field Steve Lockhart, Roy Chamberlain and Dickon Parnell. 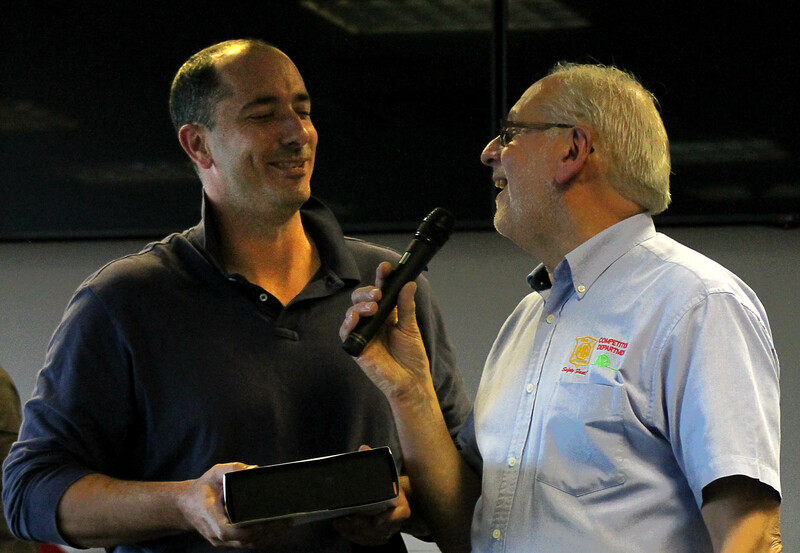 Rob Spencer teamed his earlier BCV8 Championship victory with Thoroughbred Sportscar Championship success. With more of a cushion this time around, Spencer controlled his way to 2.2 second triumph over James Wheeler. As the race began, Spencer immediately seized control, as Russell and Spencer McCarthy followed. With little between the top six cars, Spencer had a tough job to hold his ground, as his rivals tried their best to distract him. Unfazed by the competition, Spencer eventually edged away slightly. 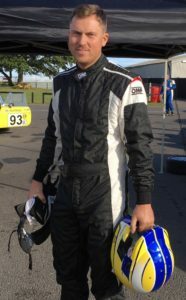 The rhythm soon simmered, when Wheeler eased his way into second place, to finish just 0.3 seconds ahead of nearest challenger Russell McCarthy. 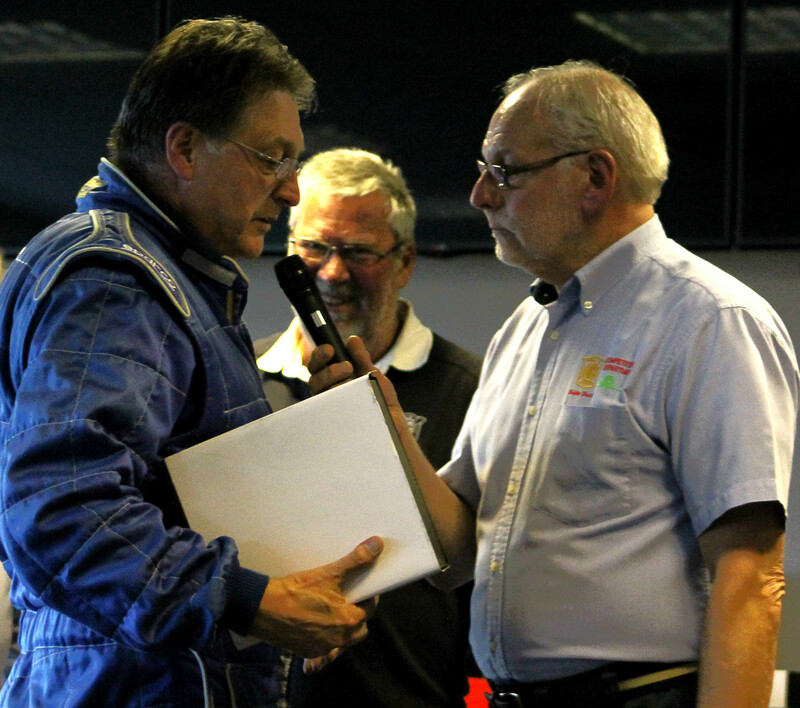 Behind the top three, Neil Fowler and Spencer McCarthy followed, whilst Ken Deamer claimed a Class D victory. A warning from the pit lane saw Simon Cripps’ chances scuppered, when the mechanical issue flag was waved in his favour. After an initial visit to the pit lane dropped him to 14th place, Cripps’ race ended shortly afterwards with a terminal issue.